Rulership, Exaltation, Mulatrikona & Debility take precedence over friendship & enmity. 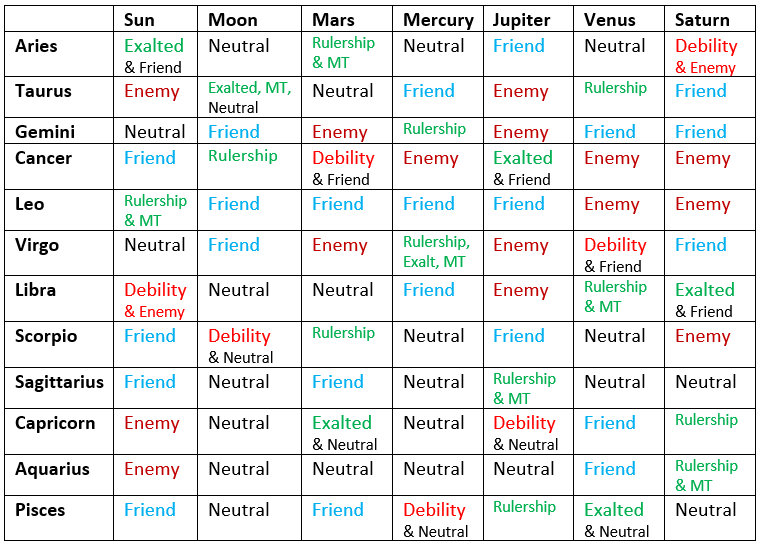 Friend, Neutral or Enemy should only be considered when none of those are present. The first two tables you can find in several sources. The third color coded table was designed by Julene for a quick reference for study sheet. It is absolutely OK for you to copy and print the image of this table for your own study. It is NOT OK to use these table images for publication in any form (including written print, electronic/internet print websites, blogs, power points, etc) without permission from Julene. Use the contact form.